Here are some images of the jackets I collaborated on with Kate Gilbert for her exhibition titled Hide:Seek. Check out her website for more images from this awesome exhibition (including some hoods designed by Kate and assembled by me). Click any of the images to go to the exhibition photo gallery. 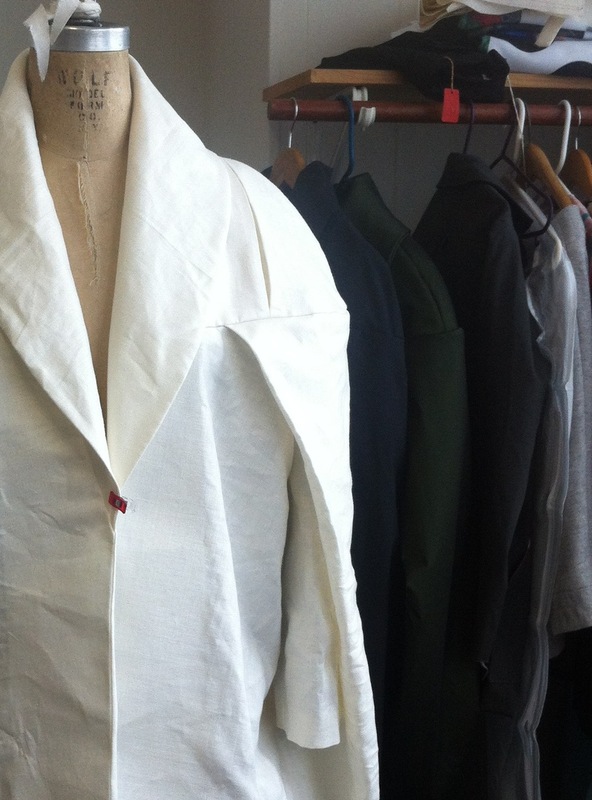 This particular coat featured lining AND underlining. I was able to omit the underlining for the first two versions since their fabric was stable and stiff. The third version, made from a black and copper jacquard was more flimsy and required underlining. I chose to underline the jacquard with poly organza to give it stiffness while still keeping it light. But how to cut out pieces larger than a cutting table, cut on the fold and all underlined while being time efficient? I organized the fabric into layers...luckily both the jacquard and the organza were fairly stable. I pinned 1 layer of jaquard and organza together, matching selvedges and ripped cross grain, and smoothed the fabric to relax the grain. I then layered the next pair of fabrics one at a time, making sure to align selvedges and grain properly. The show is up MAY 28 - JUNE 1, 2013 with an opening reception on THURSDAY MAY 30, 2013, 5:30 - 7:30 at CARROLL AND SONS 450 HARRISON AVENUE, BOSTON, MASSACHUSETTS 02118. One of my favorite things is getting clothing commissions from other artists. Recently, I was lucky (pun intended, you'll see) enough to work with Joe Joe Orangias, an excellent artist and a good friend, on a garment for his MFA thesis show Lucky Strike. Joe Joe's work for the show was a series of objects crafted out of materials salvaged from the former Lucky Strike bowling alley. The alley itself is around the corner from The Howard Art Project, the location of my studio space as well as Joe Joe's thesis exhibition. Joe Joe and I collaborated on a vintage-styled bowling shirt. It featured a felt bowling applique on the back (that's candlepin bowling btw, for you non new-englanders. Far superior to standard bowling) , as well as a contrast collar and patch pocket and gold soutache embroidery: "Post-Bowler". The shirt was adapted from a pre-existing men's camp collar shirt and altered to meet Joe Joe's specifics. The main body is a nice taupe linen, with contrast in cotton broadcloth. Colors were chosen to match existing shoes salvaged from the bowling alley. Soutache braid returns as shoelaces. I had a lot of fun with this project. Joe Joe's exhibition was a huge success. I'm lucky enough to be working with another artist, Kate Gilbert, on an exhibition involving wearables. I am working on a custom dress for one of the designers behind Possible Worlds. The fabric is one of their designs, in a lovely crepe de chine. Here are some in progress shots. I'm just putting the finishing touches on before meeting this week. 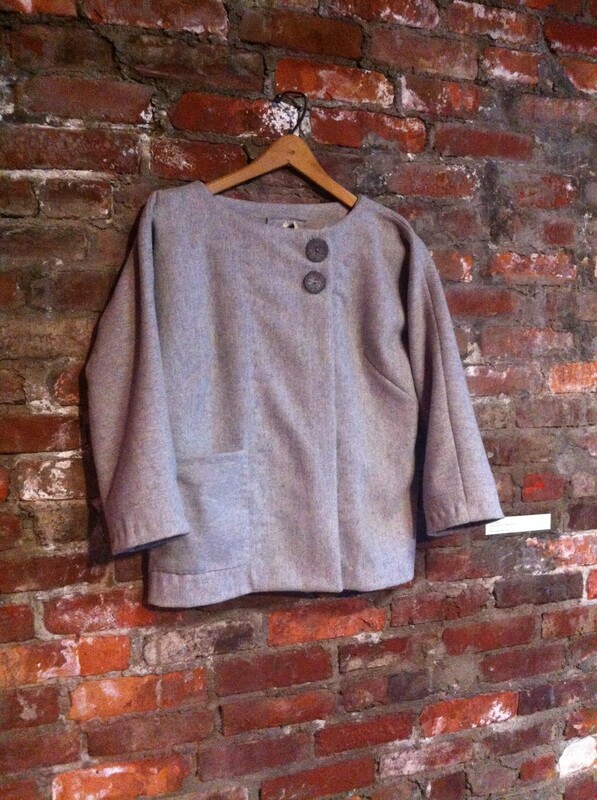 For a group exhibition titled SLOWNESS at the Howard Art Project, I created a grey felt jacket. The piece, Phantasmagoria: GreigeGoods, is an investigation into the work of sewing and expenditure of time as it relates to our large scale consumption of clothing and our lack of recognition of the time, energy, and materials spent creating said clothing. Aside from the main constructions elements, the coats finishing is done primarily with stitches rendered in text, specifically for hand-sewn elements that are usually hidden in a finished garment (facing, catch stitch, bound buttonholes, hems, etc). The jacket was shown alongside a excerpt from a slide presentation that I delivered on the night of the opening. The video below, featured in the presentation, shows myself at work creating this jacket along side the industrial manufacturing of a clothing article. slownessvid from taylor MV on Vimeo. The video on the left shows documentation of my process in cutting, constructing, and embroidering the jacket. The footage has been abbreviated and sped up to be approximately as long as the video footage on the right. The right side video shows clips of the manufacturing segment from the Discovery Channel show "How It's Made: Jeans" for comparison. Recently a friend of my husband requested some help making a pattern from a bag she had borrowed. It was made from a well loved red rayon faille, with a cute little drawstring. The shape was particularly intriguing...a sort of clutch wristlet with little fins to create its unique shape. The bag at first glance was sweet, but up visually deconstructing the shape and construction, it became brilliant. The proportions, the transformation between uncinched and cinched, and the odd little fins. I decided to test the pattern (and make one for myself!) using an odd primaries print on cotton sateen that I picked up at a thrift store years ago. The lining is a heavy yellow twill to give the bag a bit more structure. The drawstring is silk crepe de chine.